Who’s ready to finish recapping the Blank family? I know I am! So, we left off with Bo deciding to confess to Heaven that he’d been running all over town revealing himself to be an alien. Let’s say he buried the lede here. He started by talking about when he was abducted. He’d reached out to their mission control on Sixam to ask for a meeting. He gave them a status update on the mission, and based on his feedback, they decided to expand the mission objectives. Heaven waiting for him to get to the point. She knew mission control wouldn’t change the mission unless they had a solid reason to believe it might help their research. Which means Bo had already started doing research. He eventually got to the point of confessing how many Sims he’d revealed himself to. Heaven was furious, and was really worried that Bo had compromised the mission. She worried their children would never find Sims to marry and procreate with once the secret was out. Bo assured her that he’d only revealed himself, not his family. Heaven didn’t understand why anyone would think the offspring of an alien wouldn’t be at least part alien. Bo couldn’t explain the logic, but simply stated that anything was possible. Heaven told him she needed time to process his betrayal. He agreed to give her time. Olivia Spencer-Kim-Lewis had been coming around since she was a young girl. When she came around as a teen, things between her and Asa quickly changed. They seemed to be as fond of each other and newly fond of each other all at once. Asa had his eye on a few girls at school, but he couldn’t deny that Olivia seemed the best of them all. Things were looking up for Asa, but they were headed downhill for Bo. Heaven had finally wrapped her head around him revealing himself to be an alien. She was pissed. 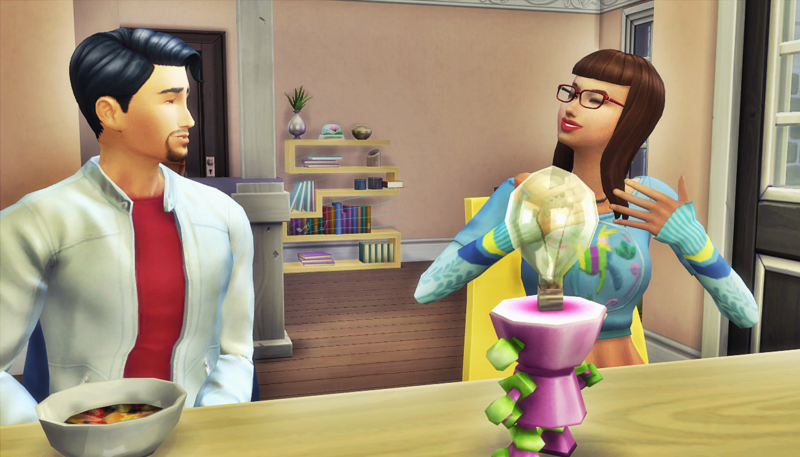 She remembered when he confessed about using Sixam gardening techniques, and asked if Sims already knew about his background then. He tried to explain that he wanted to tell her, but was worried how she would react. Heaven explained that she felt disrespected and cut out of important family and mission decisions. She told Bo how if he’d told her sooner, she could’ve had some input on his behavior that could’ve negatively affected their whole family. 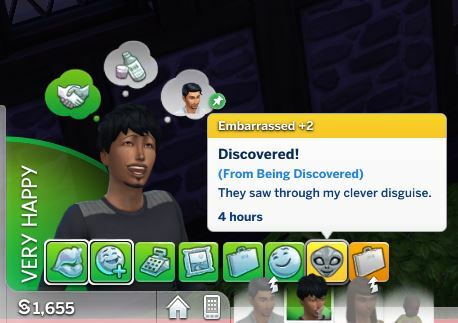 As far as she was concerned, he got lucky that the Sims responded well, but that he shouldn’t have risked the whole family to find out. If he wanted to come on this mission by himself, as a single man, and throw caution to the wind, that she might’ve been more open to that. She would’ve preferred to come on this mission by herself as well. She was so hurt by his decision, she felt like he wasn’t treating her life a wife. He made risky decisions for her without fully considering the consequences, and she wasn’t going to ever let that happen again. She told him she decided she would have to leave. She loved him and didn’t want to leave the marriage. She just felt like she was left with no choice. Bo tried to figure out how he could fix this. Heaven told him he couldn’t. The time to fix it passed when he sought out a private meeting with mission control, continuing to cut her out of the process. She couldn’t support he current mission goals. She didn’t want to reveal herself as an alien if she didn’t want to. And she didn’t want to risk her children’s future. Since she couldn’t get on board, she figured the family would be better off without her. Bo was unconvinced that she really wanted to leave their family. They stared at each other for a long time without saying a word. And, well, you know these darn autonomous Sims of mine. Bo wanted to believe that Heaven wouldn’t leave. Not after they’d just expressed their love for each other. 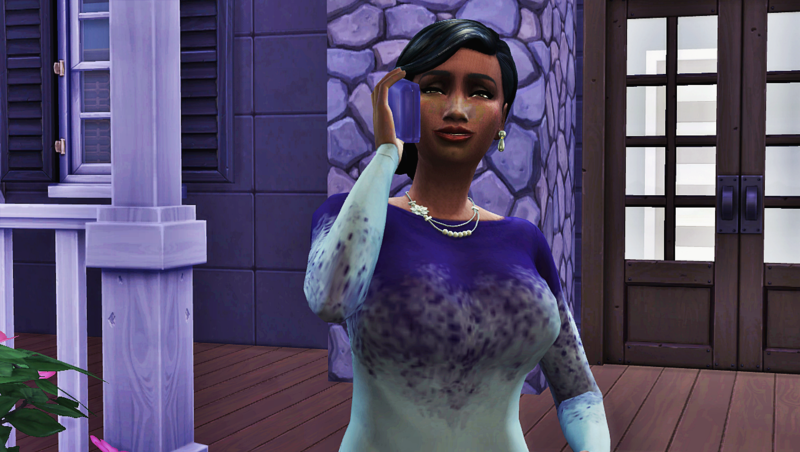 For the first time since setting foot on the soil in Newcrest, Heaven used her powers. She sent her thoughts and feelings to Bo. He finally understood. She really was leaving, and it was all his fault. Heaven decided she should be the one to tell Gem and Asa about what happened. She wanted a chance to explain why she was leaving without ruining their perception of their father. It was a difficult conversation, but they got through it. She was moving to a house nearby, and promised she would still be their mother and would do her best to support this new version of their mission. Heaven moved in with a couple of Bros, and felt like this was a positive change. She was finally around people who got her and her music. And she didn’t have to worry about Bo revealing all the alien secrets at any given moment. There was just one complication. Not knowing the result of their last time together, Bo was trying to adjust to life without his wife. That meant he had to get a job to support the kids. Gem agreed to get a job as well to help supplement the household income. She was still a daddy’s girl and wanted nothing more than for this new version of the mission to succeed. Gem wasn’t sure how she felt about revealing herself as an alien when the opportunity presented itself, but she would finally get an opportunity. A new family had moved in next door and they had a teenage son. She thought he was pretty cute, in a really unique way. She couldn’t imagine telling him she was an alien though. Her entire childhood, it’d been drilled into her to reveal that information under no circumstances. It would be hard to change things now. She figured she’d worry about it later. She just wanted to have the type of fun she’d always heard teenage Sims had. Bo knew it was time to call a club meeting. He was still reeling from Heaven leaving him, and he had more research to do. 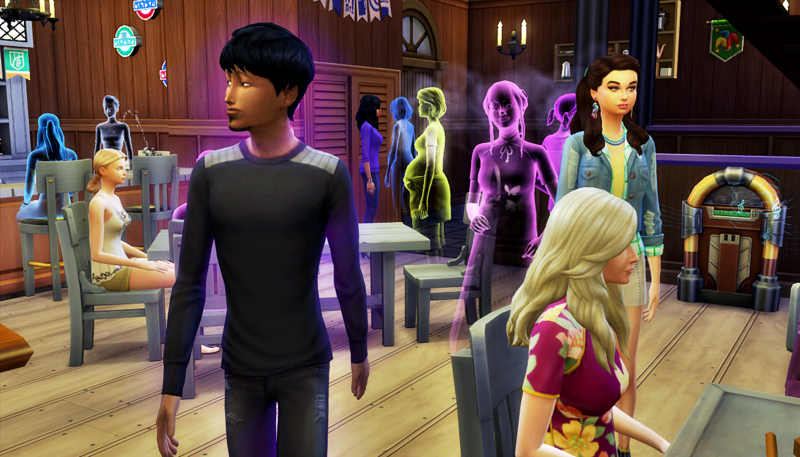 The club members were all unaware that he was an alien thanks to some memory wiping. So he put his plan into action. They club showed up right on time. He told them about him and Heaven breaking up. They were sad for him, but none of them really knew Heaven well at all. They just assumed it was typical marriage problems and didn’t press Bo too hard for the gory details. Bo decided to invite the club out to the pool. It was time for his big reveal. While they were relaxing in and around the pool, Bo announced he had something to show them. And show them, he did. After they recovered from the initial shock, they went back inside so Bo could answer their questions. No, Heaven didn’t leave him because he’s an alien. Yes, he’s here on a mission. No, that mission is not to enslave the Sims. Yes, he can turn his disguise on and off. No, the water doesn’t wash it off. Yes, he’s still him, he swears he wasn’t body snatched. No, he cannot turn anyone else into an alien. Yes, he has powers. No, you cannot see them. Bo finally relented to show Gavin his powers. For the most part, the club seemed okay with the information. They all had secrets, and they were slowly being revealed as the club got closer. As far as they were concerned, this was just another layer of their closeness to unwrap. Bo resumed his disguise and ended the club meeting so he could turn in for the night. Heaven still visited to spend time with the kids. When she was there, it was obvious her and Bo still loved each other very much. But she refused to consider coming home. Bo started to think that maybe she just used his deception as an excuse to escape a life it never really seemed she wanted in the first place. Before long, the result of their long kiss goodbye was ready to join this world. Heaven enjoyed her infant, but she knew what she had to do. She called Bo and asked him to bring Asa and Gem by her house. Heaven introduced her family to their newest member. The teenagers were shocked that they had a new baby sister. She looked just like their disguises. 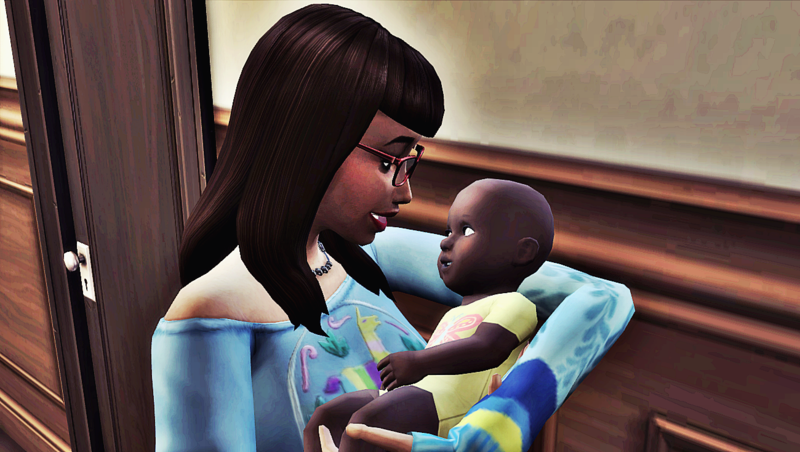 Heaven confirmed the baby was born a Sim. She’d reported back to mission control about the baby’s genetics. Their theory was that the aliens had worn their disguises for so long, it affected the gestation of the baby before birth (aka darn MCCC occult settings, lol). Heaven surprised her family by requesting that they take Sky with them and Bo continue to raise all three children. He assumed there would be a joint custody arrangement, but Heaven told him that wasn’t possible. She was working far too much these days, something Bo would never understand. And her roommates would never allow her to have children at the house that often. Her family felt there were other options she might consider, but she told them this as the only way. 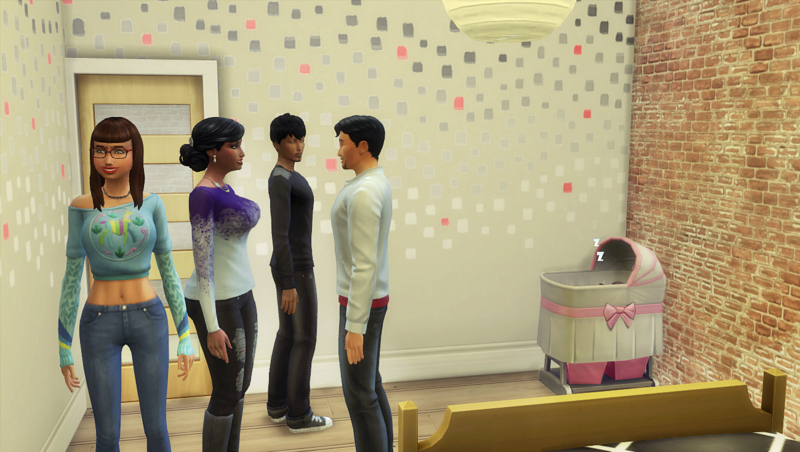 Her roommate wandered in just in time to confirm that they baby couldn’t stay there. Bo agreed to take Sky. Gem announced she would help because she didn’t want her sister to know what it’s like to feel abandoned. Asa was frustrated with his entire family for not doing more to fix things, but he didn’t have any suggestions to offer to make things better. After school the next day, Gem and Bo talked about what happened. She could tell he was worried, but reassured him that they would get through it. He was so proud of her maturity and grateful for her support, and he told her so. Bo wasn’t sure how he would fare, but he knew he wouldn’t give up. 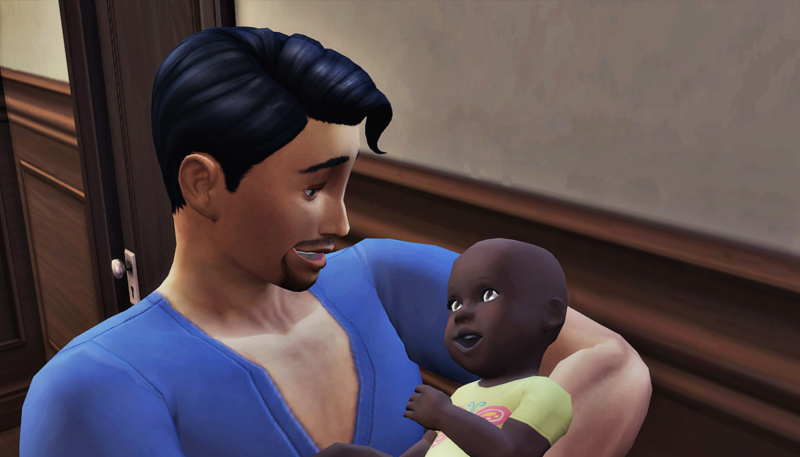 He promised Sky that he’d be the best father to her and always learn from his mistakes. Staring at her was like staring at a miniature version of Heaven’s disguise, and he was sure that simply made him lover her all the more. Gem also made she her baby sister knew she would be well taken care of. She promised to stick around until she could take care of herself, making sure she knew no one would ever abandon her again. Asa didn’t have the we’ll-get-through-this-somehow gumption of his father and his sister. He was pissed. And he had no one to notice he was acting out. He skipped school and went to the pool. 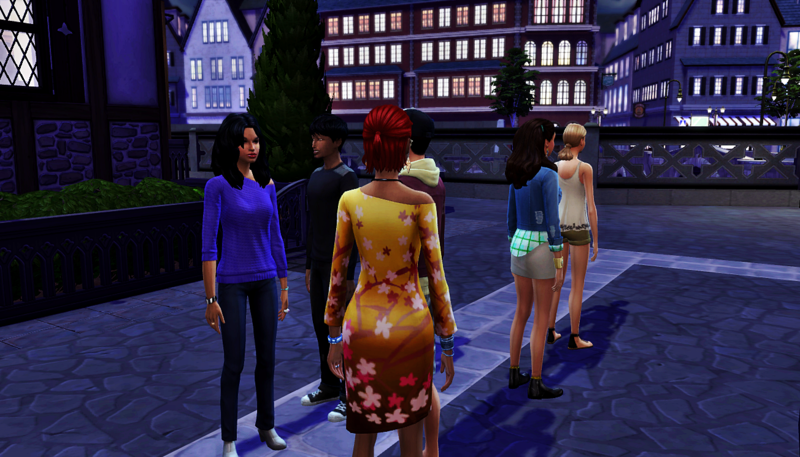 Then he met his friends out at a Windenburg bar really late that night. Everything was going great between him and Olivia. And then Asa got really happy. And it showed. He had already decided he wasn’t revealing himself as an alien, no matter what the rest of his family did. But biology took over. He was so embarrassed. 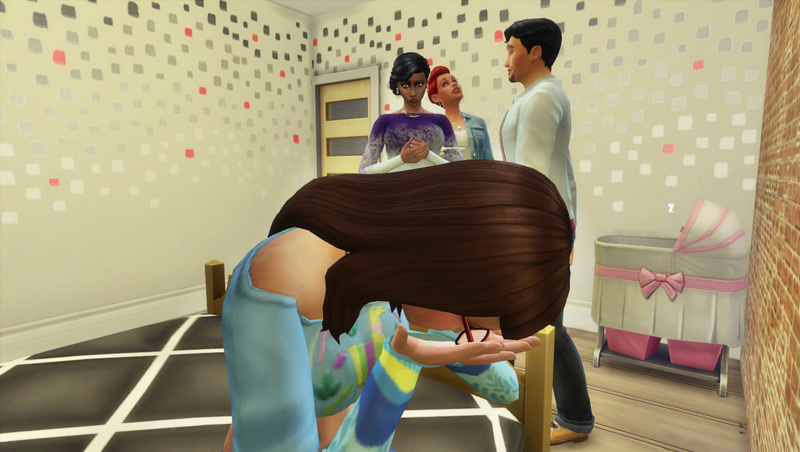 But Olivia, like many Sims before her, didn’t care at all. So Asa smartly got over it, and the night went back to being great. Asa was trying not to worry too much about being seen as an alien. But luckily, it was ghost night, so he blended right in. Guess what guys? That concludes our recap of the Blank family! We’ve just got one more family to go: the Ralston family. Look for that recap in a few days! Golly! Reading this recap brought back to me how sad I find this arc…. of course , I had dental work done yesterday , so I’m feeling kinda fragile , but I almost started crying reading about the break-up! Awwww, Bo and his family went through a lot, it’s sad. I’m sorry out almost made you cry.